Let me say right at the top: From the Heart by Heartland Men’s Chorus was simply phenomenal. I haven’t been to a HMC show in more years than I want to admit, but the experience I had on this evening made me deeply regret those missed opportunities. Fortunately for folks like myself, this performance, by virtue of being a “greatest hits” compilation of their most compassionate repertoire, does give a new (or lapsed) patron the chance to partially catch up on some of the energy and emotion that the Chorus has been sharing with Kansas City audiences since 1986. Upon arrival at Church of the Resurrection, I was a little concerned at the distance the choir loft was from the audience, way up high against the wall, across a wide, wooden dais that appeared almost as large as a regulation basketball court; distance during the presentation of such emotional content as was on the bill for the evening isn’t the best way to assure the impression you want to make. That concern faded quickly as the lighting was adjusted to theatrical norms, and close-ups of the choir began to appear on each end of the stunning, hundred-foot long, curved video screen just above the last row of the loft. There were several times I was brought to tears as the evening progressed. In those moments, sometimes it was the beauty of the melodies, and sometimes it was the sentiment in the lyrics, introductions, or spoken-word narratives. At other times, it was probably due to hearing such music within the vibrant sanctuary, with its amazing one-hundred-foot stained glass sculpture above the choir loft; or the projections of colorful sunsets, volcanoes, ocean waves, and excerpts from Maya Angelou’s inspiring poems flashed at exactly the right time during a song. But in the end, it is the seamless merge of the tenor, baritone, and bass parts, and the clarity of the phrasing and enunciation by the Chorus’ 80 voices under Cates’s baton that made the 14 songs and medleys performed work. Trust me, folks: hearing this level of proficiency, hearing the harmonies, dynamics, and crisp lyrics all working together this well in live performance by 80 voices is something very, very special. Yes, of course, the songs have to be superb for it all to come together of a piece, and indeed, there was not a weak spot on the program tonight. The songs were powerful, heartfelt; and had dramatic heft both individually and altogether. Beginning with the inspiring “Calling My Children Home,” continuing with the world premiere of “As I Have Loved You,” and on through “Everything Possible” and “I Sing Out”—all of the material was engaging, uplifting, and entertaining, too. The second half of the intermission-free evening took the dramatic level up even higher still, with back-to-back renditions of “Like Dust I Rise,” a song cycle of four poems by Maya Angelou (“On the Pulse of Morning,” “Caged Bird,” “Equality,” “Still I Rise”) set to music and arranged by Mark Hayes, and the song “I Love You More,” which is from Tyler’s Suite, a nine-piece choral work dedicated to the memory of Tyler Clementi, a young musician who died by suicide after being bullied by his roommate during his first weeks of college. Both selections featured both the Chorus and fine soloists, including Ron Williams, Scott Ireland, Dr. Paul Bolton, R. Elise Pointer, and Kelly Marzett on the former, and the always-terrific Nancy Nail on the latter. I am embarrassed to say I was unaware before tonight of just how significant the work of Mark Hayes is as a composer, pianist, and conductor—we are fortunate that he calls Kansas City home. For this evening’s concert, besides being the composer/arranger of “I Sing Out,” “Grace,” and “Like Dust I Rise,” Hayes accompanied the Chorus on several of these songs, and also performed four songs from his recent album, either as solos or with cellist Sascha Groschang. “Rhapsody;” “Improvisation on ‘O Waly Waly’” (“The Water Is Wide”); a fine chart of “Over the Rainbow;” and a version of “How Great Thou Art,” which had both a contemporary touch and a bit of an old-time, Baptist-barrelhouse gospel feel, were all very well done. I will also mention the other fine musicians who contributed so subtly and so well to many of the arrangements: Ron Ernst on drums, Ry Kincaid on bass, Greg Maupins on percussion, and particularly the Chorus’ regular pianist, Robert Lamar Sims. And not to forget the wonderful ALS interpreter Jeffrey Dunlap. 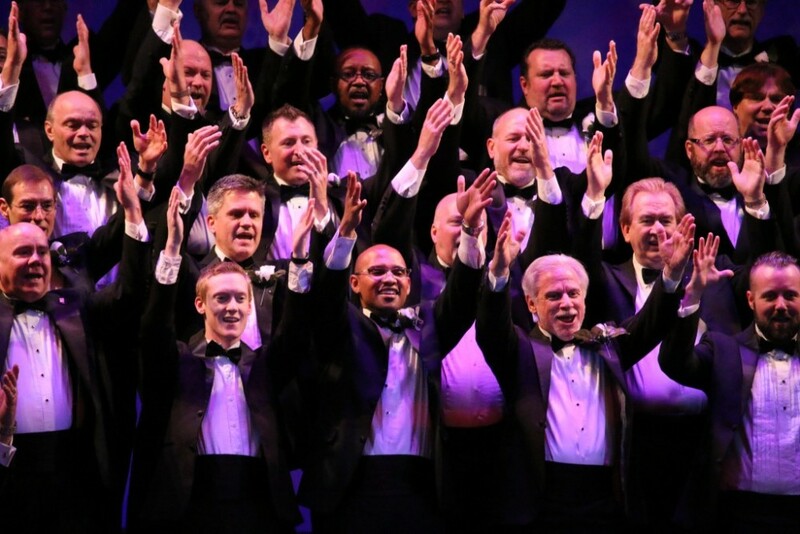 So, even though a time machine can’t take me back to the Heartland Men’s Chorus shows I unfortunately missed, this superb retrospective was a great reminder not to let it happen again. Copyright © 2017 KCMETROPOLIS.org Used by permission. Todd Gregory-Gibbs on “1,000 Beautiful Things” From the Heart: Huge Success!